ANZAC Day falls on April 25 each year and celebrates the start of Australian and New Zealand military forces action in the first World War. People will often attend a parade or ceremony honoring those that fought as well as honor the people serving in the military today. This day is a national holiday with government and most business offices closed. On April 25 1915 the forces of Australia and New Zealand landed on the shores of Gallipoli with the purpose of taking the Gallipoli Peninsula during World War 1. New Zealand lost roughly 3000 men during the 8 month long battle. 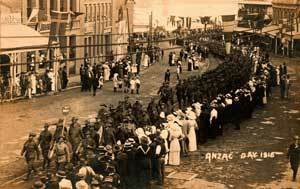 ANZAC day first became a public holiday back in 1921.